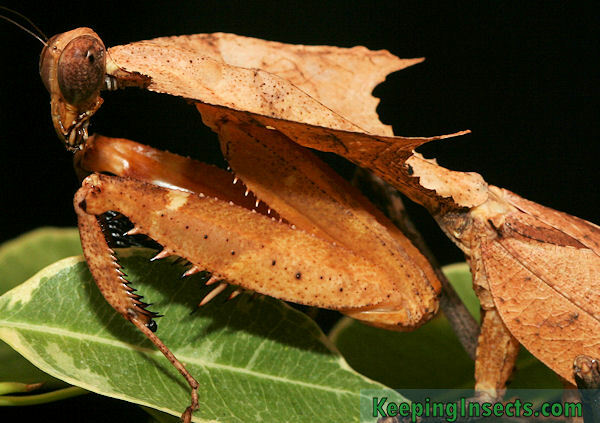 The Dead Leaf Mantis, or Deroplatys desiccata, is a large mantis from Malaysia that is camouflaged as a dead leaf. It looks amazing! They are not very easy to keep and breed, but it is definately possible. 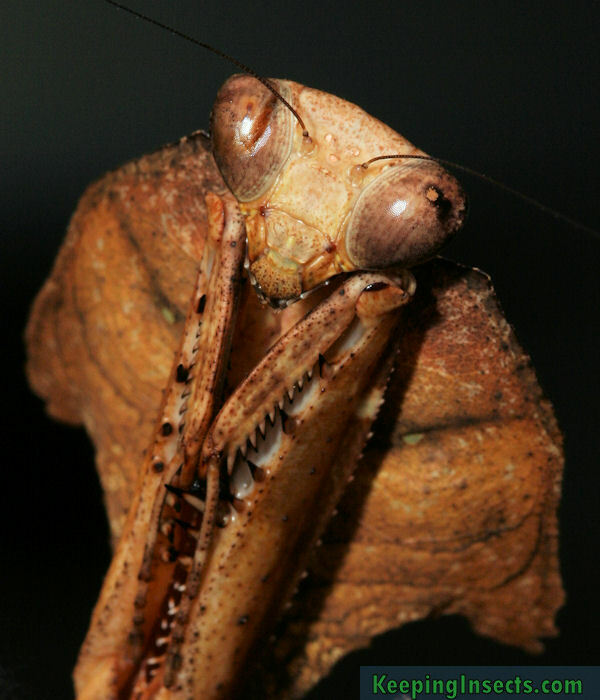 This species of praying mantis is always brown, but the shade of brown may vary between individuals. Their brown color is not solid all over, but it has dark and light spots to mimic a dead leaf. On their back they have a huge shield (prothorax), making it look even more like a dead leaf. This feature can be seen almost all species in the Deroplatys genus. 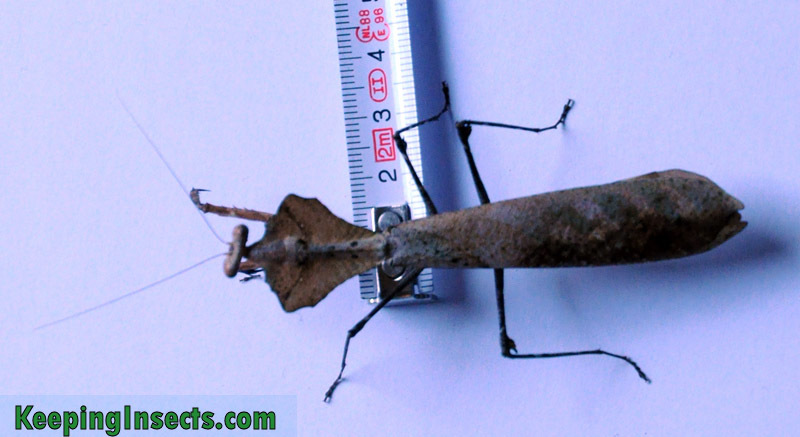 This is one of the largest species of cryptic mantis kept in captivity successfully. 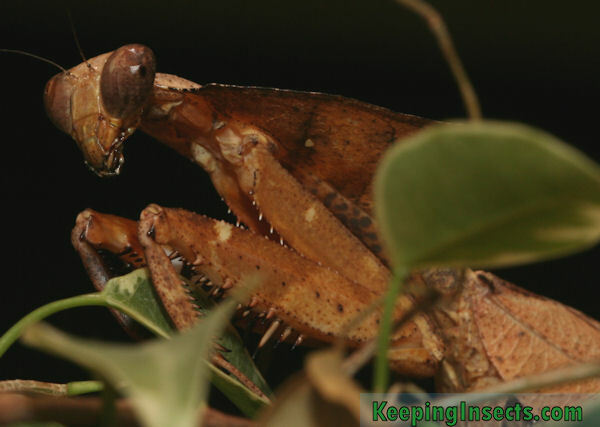 They are about as big as the commonly kept species (Sphodromantis, Hierodula) but are very well camouflaged. Females are about 9 cm long, the males are a bit smaller with their 7 or 8 cm. Males have a small shield on their prothorax and their body is not as wide as that of the females. Males have wings that extend almost one centimeter past the abdomen, while females have wings that reach just up to the abdomen. 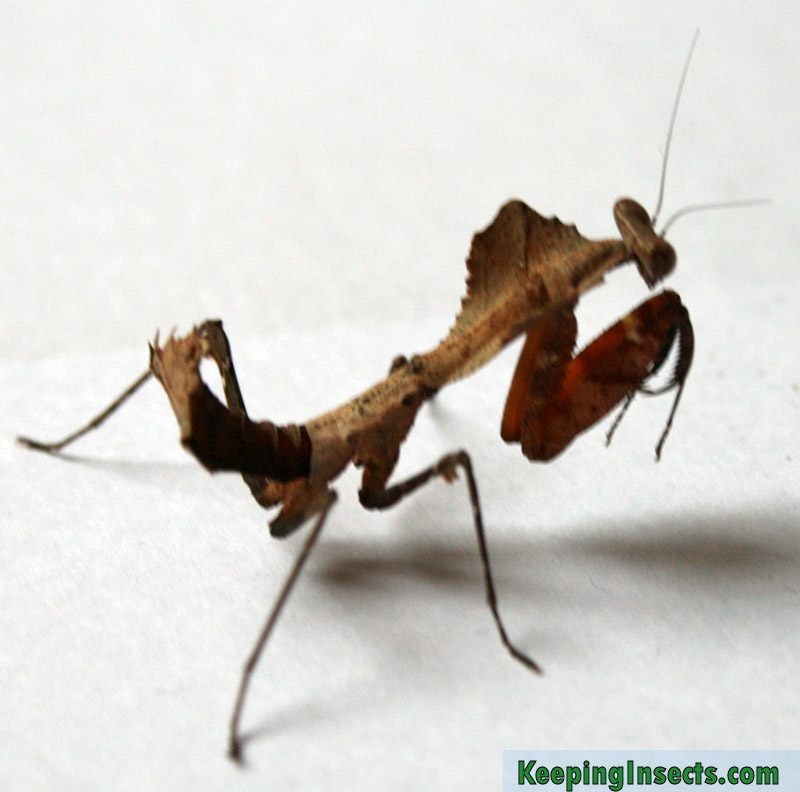 Deroplatys desiccata is a pretty docile species of praying mantis. They can be easily ‘scared’ by large prey or the hand of their owner, making them run away franticly or display a death feigning behavior (play dead). 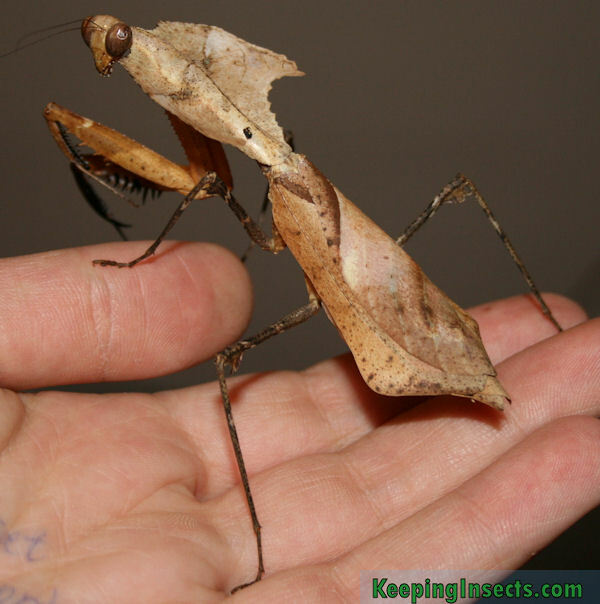 During this display the mantis will lie motionless on the floor, legs folded or stretched out. They do not move even when you touch them. Sometimes they suddenly get up and start running away. 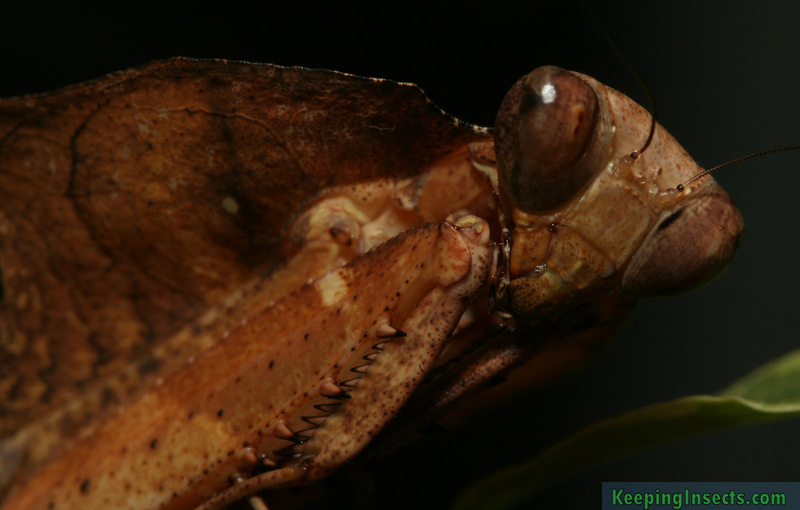 When adult, Deroplatys desiccata can also display its wings when threatened. This is called a deimatic display, designed to scare off predators. The mantis shows its front wings that have a large black spot on them, and it shows the hind wings that have black and white stripes on them. When the wings are raised suddenly, these colors become visible and can scare away predators such as birds. During the deimatic display the mantis will also raise its forelegs to show a red area with bright black and white stripes (zebra pattern). The ideal temperature is about 26 ° C, but keeping them warmer is also good to about 35 ° C. Do not keep them cooler than 22 ° C. At night you can allow the temperature to drop until 18 ° C.
This species likes a slightly higher humidity, so it is important to spray water reguarly. A target humidity is about 50 to 80%. Keep the enclosure well ventilated. 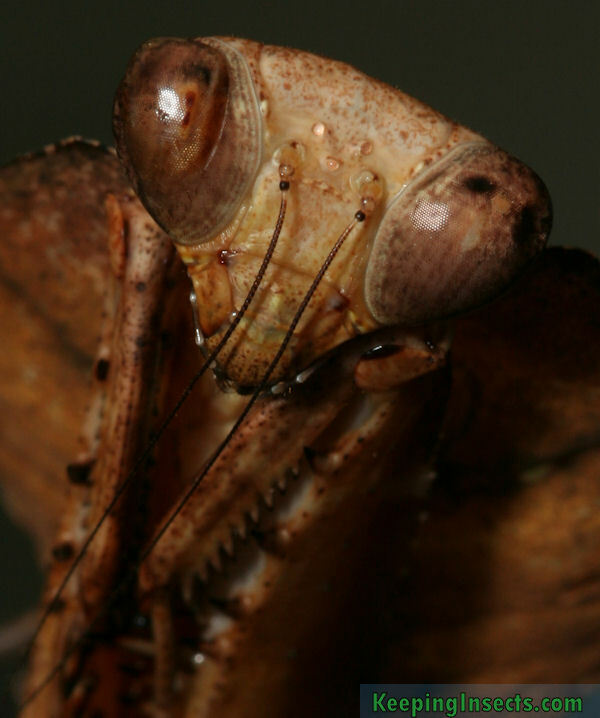 As with all species of praying mantis, the enclosure needs to be at least 3 times the length of the animal is height, and at least 2x the length of the animal in width. For an adult female this means the enclosure has to be at least 27 cm in height and 18 cm in width. A nice size for a terrarium would be 30 x 20 x 30 cm or bigger, so there is room for perches and decoration such as dead leaves. 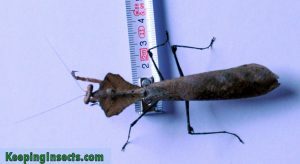 Deroplatys desiccata is not very aggressive to members of its species, but it is better not to house them together in one enclosure. Sooner or later cannibalism will happen. Until L4 (fourth instar) the nymphs can be kept together when fed constantly. When adult, the differences between males and females are not to be missed. The male is long and slender, while the female is broad and bulky. She has a huge shield on the prothorax, while the male has a small shield. For nymphs you can use the sexing method of counting the number of segments on the abdomen, as described here. Approximately 2 to 4 weeks after both partners reach adulthood, a mating attempt can be made. Make sure that the female has eaten a lot in the days before the mating attempt. The female can be quite aggressive to the male, so if you see excessive aggression you have to remove the male and try again later. Try to minimize disturbance. Mating can take several hours, when the male leaves the back of the female he must be removed from the enclosure to keep him alive.